PETA and Poe: A Coupling Not to be? February 17, 2011; Source: Mother Nature Network | The city of Baltimore has regretfully decided to eliminate funding for the Edgar Allen Poe House and Museum, leaving the organization to fend for itself for the first time, in a truly horrific economy. It costs just $80,000 a year to run the organization, a price tag that is now being paid out of pocket by the museum’s curator of 32 years. So People for the Ethical Treatment of Animals (PETA), always on the lookout for a creative way to get people to pay attention to its cause, offered to provide some funding in return for the display of an ad that would read “The Tell-Tale Heart of a Meat-Eater. 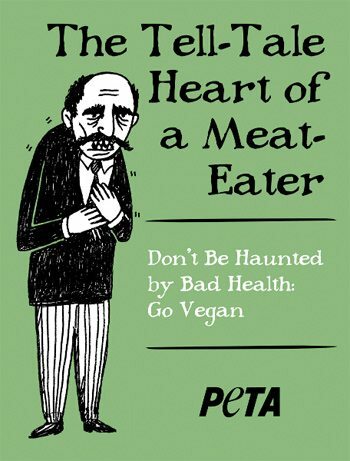 Don't Be Haunted by Bad Health: Go Vegan. PETA." But Baltimore City Planning Director Tom Stosur says, "The interest and creative suggestion is appreciated, but the museum's landmark status doesn't allow for ad displays for products or causes outside and space is limited inside." Apparently, even though it no longer pays for the facility, it wants to lay claim for the pure principle of the thing. Our opinion is you should not be able to have it both ways, Mr. Stosur. Pay up or shut up. After all, Poe was a fellow bird admirer so there is some alignment. Honestly first the roses and cognac disappear and then this public disavowal from a city that boasts on the man? I am getting out my checkbook and paying homage to one of my most favorite poets. Now to conclude, I’ll just share the following excerpt from Poe’s, “The Bells.” Read it aloud once with feeling.